TurboTax Online Deluxe and Premier charge $39.99 for a single state return with free state e-File. Simple state tax returns are free (no itemized deductions, no 1099-MISC, no stock sales). H&R Block Online Deluxe and Premium charge $36.99 for a single state return with free state e-File. Simple state tax returns are free (no itemized deductions, no 1099-MISC, no stock sales). You can’t itemize deductions, have stock sales, or have 1099-MISC income, for example. They offer all taxpayers free electronic filing via official state-supported software. They offer all taxpayers access to free “fillable forms” which are basically electronic versions of the paper forms where you can type in numbers and any mathematical calculations are done for you. If your state tax returns are relatively simple, this may be all you really need. They allow commercial vendors via the “FreeFile Alliance” to offer free online filing for certain groups, usually through income limits, age restrictions, and/or active duty military personnel. The vendors in turn make money when some folks end up not qualifying and have to pay at the end. Below, you’ll find free e-file information for all 50 states. Alabama Free electronic filing using through My Alabama Taxes (MAT). No income restrictions. Arizona File using AZ-specific fillable forms; No income restrictions. FreeFile options also available; income and/or other restrictions apply. Arkansas Various FreeFile options; Income and/or other restrictions apply. California Free electronic filing using through CalFile, UDS, and others. No income restrictions. Colorado Free electronic filing using through Revenue Online. No income restrictions. Connecticut Free electronic filing using through TaxPayer Service Center (TSC). No income restrictions. Delaware Free electronic filing through official state website. No income restrictions. Georgia FreeFile options available; income and/or other restrictions apply. Hawaii File for free at Hawaii Tax Online. Idaho FreeFile options available; income and/or other restrictions apply. Illinois Free electronic filing through MyTax Illinois. No income restrictions. Indiana FreeFile options available through INfreefile; income and/or other restrictions apply. Iowa FreeFile options available; income and/or other restrictions apply. Kansas Free electronic filing through KS WebFile. No income restrictions. Kentucky FreeFile options available; income and/or other restrictions apply. Louisiana Free electronic filing through Louisiana File Online. No income restrictions. Maine Free electronic filing through Maine FastFile. No income restrictions. Maryland Free electronic filing through Maryland iFile. No income restrictions. Massachusetts FreeFile options available; income and/or other restrictions apply. WebFile for Income was shut down in 2017. Michigan FreeFile options available; income and/or other restrictions apply. Minnesota FreeFile options available; income and/or other restrictions apply. Mississippi FreeFile options available; income and/or other restrictions apply. Missouri FreeFile options available; income and/or other restrictions apply. Montana FreeFile options available; income and/or other restrictions apply. Looks like they recently get rid of free electronic filing through Taxpayer Access Point (TAP). Nebraska Free electronic filing through NebFile. No income restrictions. New Jersey Free electronic filing through NJ WebFile. No income restrictions. New Mexico Free electronic filing through New Mexico Taxpayer Access Point. No income restrictions. New York Free electronic filing of select forms online with New York State Income Tax Web File, but note that New York law prohibits commercial software from charging an additional charge for e-filing. North Carolina FreeFile options available; income and/or other restrictions apply. North Dakota FreeFile options available; income and/or other restrictions apply. Ohio Free electronic filing through I-File from Ohio Online Services. No income restrictions. Oklahoma Free electronic filing through Oklahoma Taxpayer Access Points (OkTAP). No income restrictions. Oregon File using OR-specific fillable forms; No income restrictions. FreeFile options also available; income and/or other restrictions apply. Pennsylvania Free electronic filing through PA DirectFile. No income restrictions. Free Fillable PDF Forms also available. Rhode Island FreeFile options available; income and/or other restrictions apply. South Carolina File using SC-specific free fillable forms; No income restrictions. FreeFile options also available; income and/or other restrictions apply. Utah Free electronic filing through Taxpayer Access Point (TAP). No income restrictions. Vermont FreeFile options available; income and/or other restrictions apply. Virginia File using VA-specific free fillable forms; No income restrictions. FreeFile options also available; income and/or other restrictions apply. Washington DC File using DC-specific free fillable forms; No income restrictions. FreeFile options also available; income and/or other restrictions apply. West Virginia FreeFile options available; income and/or other restrictions apply. Wisconsin Free electronic filing through Wisconsin efile. No income restrictions. Whew, that took a while. Please share this if you think it’ll help others! Also let me know if you find any errors or changed links. Very nice list well done! Heres a question for all you tax folks though. I spent about 7 months of this year in Massachusetts and the last 5 months in Oregon. So I know that I need to file in two states, but I’m having trouble figuring out how to do it for free. (I always used Massachusetts’s free filing) Do I file once though Oregon’s and once through Mass’s or will one of them let me do it for both states. I’d also be willing to buy software (TurboTax, etc.) but it seems that its absurdly expensive to file in two states ($30 extra). So what have others done? 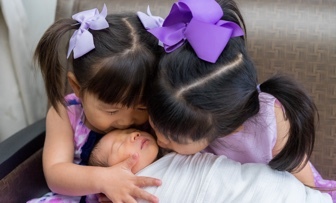 Well, you’re definitely going to have to file two Part-Time Resident returns. Some software packages let you file multiple state returns but make you pay for each separate e-file. One solution that I did was simply print it out and mail it in instead of e-filing. Just cost me under $1 for postage. So if you only get one free state e-file, just print the other one out. California state tax return does not let you file if you have capital gains or losses. That excludes anyone with mutual funds or stocks. This restriction is there because of heavy lobbying from Intuit (turbo tax). Try going to http://www.militaryonesource.com. If you are related to someone in the military, you might be able to use H&R Block. Register with Military OneSource first, then follow the H&R Block link. 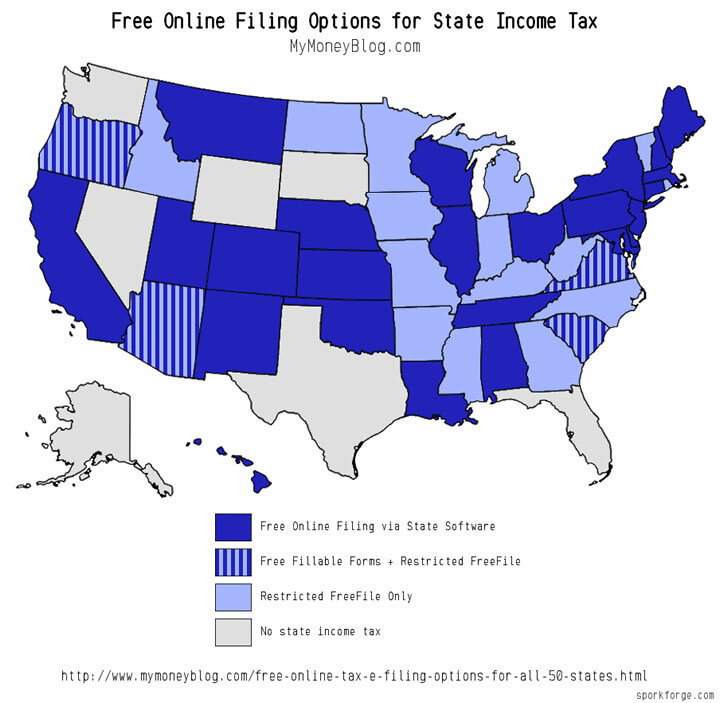 any free online filing for Montana personal income tax? Georgia must have changed their address since this info was published. Yes, New York only has free efile if your household AGI is less than $64,000. Starting with the 2009 tax year, NJ has has a $150k limit to use webfile. This is a somewhat mystifying change — it’s not like the federal free file, where there is a paid alternative above the limit. Next to Virginia it says “Filed a Virginia return last year.” Okay, this tells me nothing. Is it free or not?!? I went to Virginia’s website , spent 15 min searching, and gave up. Apparently, the conservative State of Virginia still wants their money. Updated for 2013! Note that all comments above this one are over two years old and may be outdated. No way california is “No Major Restrictions”. It does not let you file if you have capital gains or losses. Bummer. California has a pretty big restriction, and that’s if you received a refund of state income tax which is not supposed to be taxable at the state level (at least under CA law), you can’t note that on the eFile. I only noticed this because this year when I had schedule C income (which also is not possible to report on CalFile), i overpaid by ~$40 or so last year. Thanks for the clarifications on CalFile, I have updated the post. I was going to go with TaxAct but decided to go with turbo tax since I have a tiny bit of schedule C income this year. I’ll have to look into TaxAct for 2013 taxes next year but I’m guessing my income this year will increase due to rental income from tenants and may get more complicated than now…..
Tax Act looks like a bargain. But what is the experience with its accuracy and speed of acceptance from the IRS and the CA Franchise Tax Board? Do you have any evidence that it is less reliable than the more expensive Turbo Tax and H R Block programs? Hi! Random question, but can you tell me if Washington, DC had a free online e-file program for the 2014 tax year? I am doing my 2015 taxes now and I think I did mine last year for DC for free online, but this year there is an income cap. Did they change the program or program rules this year? Thank you!! Thank you for your info, but I have a question. I’ve already filed my federal from a site that didn’t do state too. Where can I file a Oregon 40N tax return online for free. Everyone I’ve checked you have to file federal with it. Please help!!! This information was last updated in 2017. Is it going to be updated for 2019? Most likely, but I would estimate that the vast majority of the links will stay the same. What state are you concerned about? It’s rather tedious to check and update all 50 links, but I’ll try to get around to it shortly. No problem, I intend to use Alabama state filing and already signed up for an account. Just curious about updating since it’s been 2 years. Note that Tennessee is the exact opposite of NY. If you use commercial software for state taxes, you MUST e-file, and pay the typical $19.95 charge to the commercial vendor. If you don’t, TN will hit you with a $25 fine. Therefore, even if you buy fed+state software, you’re stuck with re-doing your taxes on TN’s website if you don’t want to pay the $20 to e-file. It’s about the most anti-consumer legislation that I’ve ever seen. As always, there is a free option via Vita Program. I volunteer for the 3rd year. No income/age limits. Never turned down anyone. Welcome to volunteer and get a free training. Free efile via VITA tax sites. It’s a free program set up by IRS through AARP Foundation. There is no age/income limit. I volunteer for the 3rd year and we never turned down anyone. To sign up to use the My Alabama Taxes services, you have to have had a previous year’s Alabama tax return account, so won’t work if you are new, or have an occasional non-resident income, like a timber sale from land owned in the state (my situation). However, you can get a downloadable “calculating” PDF from their Dept. of Revenue site: https://revenue.alabama.gov/ Only works with Adobe as the PDF reader.